There’s no single ‘set text’ for this course, but for different parts of the course there are a number of articles, books, and videos which are worth reading or watching, or referring to. We’ll be discussing some in class, and others will be useful for more general background or taking ideas further. This list will be updated over the course of the semester, so please check back. Robert Cialdini (1984 or subsequent editions). Influence: Science and Practice. (Also published as Influence: The Psychology of Persuasion). Cory Doctorow (2018). 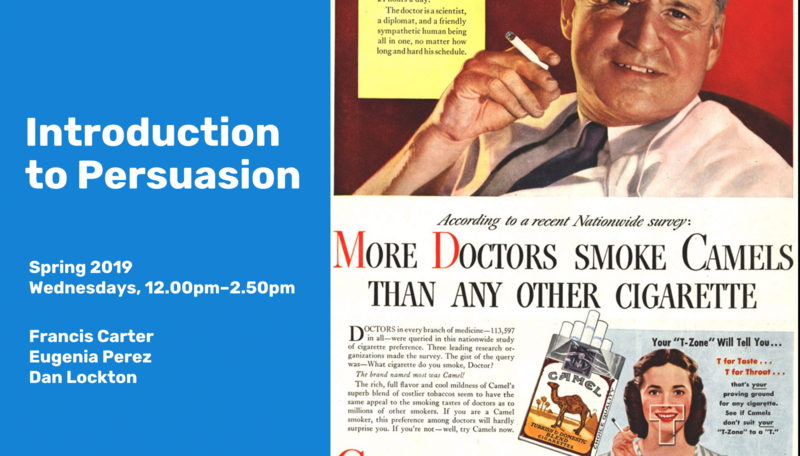 ‘Persuasion, Adaptation, and the Arms Race for Your Attention‘. Locus, January 8, 2018. Dan Lockton (2017). ‘Design, Behaviour Change, and the Design with Intent Toolkit’. In: Niedderer, K., Clune, S.J., Ludden, G. (Eds. ), Design for Behaviour Change: Theories and practices of designing for change. London: Routledge. Dan Lockton, David Harrison, Neville Stanton (2013). ‘Exploring design patterns for sustainable behaviour’. The Design Journal Vol.16 No. 4, pp. 431-459. Dan Lockton, David Harrison, Neville Stanton (2010) ‘The Design with Intent Method: a design tool for influencing user behaviour’. Applied Ergonomics Vol.41 No.3, pp. 382-392. Dale Carnegie (1936 or subsequent editions). How to Win Friends and Influence People. New York: Simon & Schuster. uence Their Behavior’. UXDesign.com, January 25 2009. Sara Wachter-Boettcher (2017). Technically Wrong: Sexist Apps, Biased Algorithms, and Other Threats of Toxic Tech. New York: W.W. Norton. Eric Meyer and Sara Wachter-Boettcher (2016). Design for Real Life. New York: A Book Apart. Lakoff, George and Mark Johnson, ‘Metaphors We Live By‘, University of Chicago Press, 1980, 242 pp. The classic scientific exploration of how we use metaphors in daily speech and thinking. Thomas Fisher (2013). Our Political Metaphor Problem, Huffington Post The Blog, April 02, 2013.